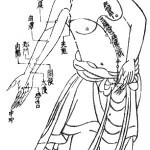 Traditional Chinese Medicine (TCM) is used as the umbrella term to describe the Traditional Arts of Chinese Medicine. This includes acupuncture, herbal and dietary medicine, tui Na (massage) and qi gong (exercise/meditation). TCM theory evolved after five element theory and its development was highly influenced by herbal medicine. TCM developed with the influence of taoist and naturalist beliefs, the central premise of which is that we live in a universe in which everything is connected. This influence creates a system of medicine that is very integrated and holistic in its approach. It understands the mind and body as connected with one part of the body affecting another. Organs and organ systems are viewed as interconnected structures that work together to keep the body functioning. TCM is the most common form of acupuncture practiced in both the UK and mainland China. Most research that is carried out is to discover the benefits and effects of TCM acupuncture and western protocol acupuncture which is developing from this.